I’ve been quiet the past few weeks due to a manic cycle in which I could not stop working on my latest obsession, 3D modeling. At some point I’m going to have a rant about how terrible Blender is to work with, but for the moment I have to rant about something else: the modding community’s confusion about what actually improves the look of models. I’ve seen people simply save original game textures at a larger size, call them higher resolution, and slap them up on a modding site for download. I’m not even going to be nice about this. Anyone who believes that improves anything is a moron. Resizing does not equal resampling. All that does is make the same level of pixelation take longer to load. 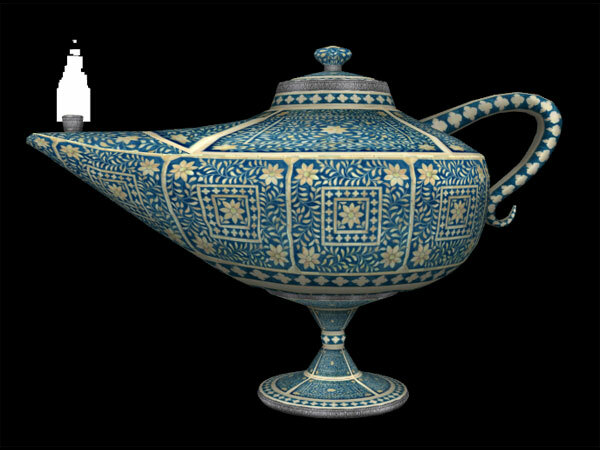 The oil lamp on the left was the one I intended to work with for a retexturing job, but after taking one look at its spaghettified texture map, decided to make my own from scratch (shown on the right). As you can probably see already, the original texture is less mushy on my model, and I was also able to use elements of the texture (the lines) that the model on the left couldn’t without smearing. The mushy model on the left has over 4400 polys. Mine has less than 1800. The difference is the former model was either made in a 3D sculpting program and never optimized, or someone took a lower-poly model, hit the subsurface button to “smooth” it by bloating its poly-count by about 10x without improving the texture map or shape, and called it a day. I made mine by extruding a cylinder by hand, vertex by vertex. I quickly learned not to trust the sculpting tools in Blender because they’re more likely to turn all my careful work to mush (though it’s great for organic objects). It took more time to do, but all the while I knew every vertex was doing its job. If I could merge a few and retain the object’s shape, I did so. Subsurfacing is not for gaming. That button was designed for the animation industry, where rendering a single frame can take hours. It was never meant for models that are rendered in real time, which is on average about 30 frames per second. Every polygon adds up. Even a gamer running a PC built like the monolith from 2001 appreciates it when their extra horsepower isn’t going towards rendering every cup and bowl and spoon cluttering NPC houses. Even with my model, when it came to UV mapping that, don’t even ask. Just don’t. That is a handsome lamp. Might it magic its way into UL at some point? I’m loving the mod. I’m on my first playthrough of Morrowind (only 12 years late!) and I installed this, LGNPC Tel Uvirith, RoHT and BUUL before I even started building my stronghold, so I can’t tell what’s original game content and what’s modded without actually looking up Uvirith’s Legacy’s features. But I love that. It speaks very highly to your skills. I’m having a blast and I’m not even Archmagister yet! I’m glad you’re enjoying the mod. The lamp will be making its way into the next version of the Tea Mod, which adds a new shop to Tel Mora and a ton of new stuff. It’s all designed to go well with Telvanni decor, but I decided to make it available to more than just Telvanni.